I love coming across books that allow the freedom to ‘think outside the square‘, so to speak. Books that play ‘chasey‘ with your imagination and let you run wild. And books that at the end of a chaotic day leave you with a warm and fuzzy feeling in your heart. The following three picture books do all those things in their own special kind of way. 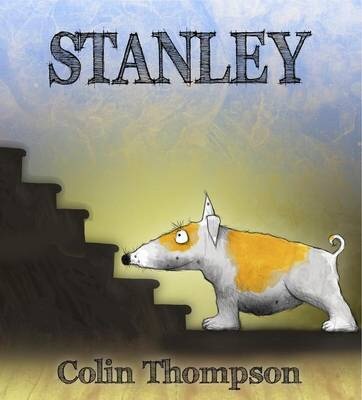 Stanley, written and illlustrated by Colin Thompson, takes quirky to a whole new level. Thompson, a legend in the children’s book world, superbly paints a solid picture of his unique characters, both conceptually and visually. Focusing on the themes of non-judgement and individuality, his descriptive language, gangly humans and mixed media images align perfectly. Stanley may look as if he was “built out of bricks that had been leant against and rained on and loved…, as strong as a mountain” but in truth he was “as soft as a pillow.” Adorably depicted across the page is Stanley in his muddy glory, sitting wide-eyed and innocent under the spotlight. As you will see, the thing that makes Stanley happy and his tail quiver most is his red ball (and his human, Gerald). Life with a small family (Stanley, Gerald and his mum) has its perks and responsibilities, but at times he feels lonely. One day, Stanley is disappointed after an unfortunate occurrence at the park. Then, without realising how it happened (since dogs usually don’t understand the intricacies of people’s bonding process), his house is filled with a new family. Stanley may not realise the connection between his park experience and his current living situation, but he finds himself enjoying the baking smells, extra company… and a brand new red ball. Although, he probably could have done without the tablecloth bridesmaid’s dress! Stanley is a witty and gentle book about the complexities of human personalities and relationships and the simplicities of a dog’s life. There is also a subtle yet valuable message about taking risks with understanding people (and dogs) and looking beyond the exterior. Recommended for primary school children. Chasing her previous excitable tale, Clementine’s Walk, Annie White‘s latest delight follows suit in the same charismatic demeanour; it’s Clementine’s Bath. Guaranteed to whip preschoolers along on this wild romp, Clementine and her smells sure do arouse. Pongs from rubbish piles are not quite considered the bed of roses that this carefree pooch relishes, and the family won’t have a whiff of it. So now she finds herself in a bit of a quandary. Bounding off in rhyming couplets, Clementine makes her dash away from the dreaded B-A-T-H and all through the house. Hiding in an assortment of obscure places, like between pot plants, into the shed and inside the toybox, Clementine’s efforts fall flat and she, to her dismay, surrenders with a SPLASH! But perhaps there are perks to being clean and pleasant-smelling, after all. 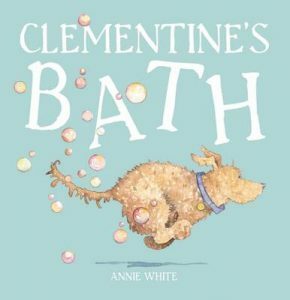 Delightfully energetic and fast paced in all the right places, Clementine’s Bath exudes this chaotic liveliness that most dog owners know all too well. With softness, warmth and colour, this book will groom young readers into the excitement of caring for a pet. Preschoolers will take absolute pleasure at the quips these characters have prepared for their readers. 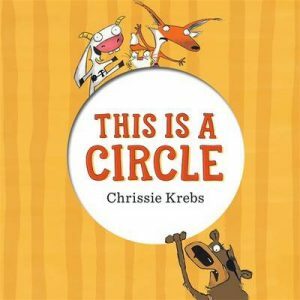 This is a Circle by Chrissie Krebs is no more than an all-rounded, wise-cracking, rhyming pursuit in top form. With bold, vibrant colours and animated personalities much in likeness of Ben Wood’s illustrations, here is a page-turning, eye-catching and whimsical tale with an abundance of energy. It all looks innocent enough when we are introduced to the seemingly-friendly characters and a random selection of labelled objects. But things quickly turn sour when animal turns against animal and objects are used for pure selfish gain. First the tap-dancing goat climbs the enormous box. Then the song-singing cat is cat-apulted up there due to his own reckless driving habits. A violent pant-wearing fox angers the wild-looking bear who chases him around and up to the top of the box (with the help of a pile of the randomly-selected shapes, objects and vehicles). And so now that they have successfully squabbled their way to the top, what will be their next quandary? A highly entertaining collection of giggles and teachable moments with its clever integration of concepts and rhyming words. The text highlights those key words with bold and enlarged print, enabling young readers to identify the sounds and main elements in the story. Oh, not to mention the slick, tactile cut out circle on the front cover is a great way to hook readers in! Funny, innovative and engaging, This is a Circle will have children from age three running in circles to have this book read to them again and again. Penguin Random House Australia, 2016. For more concept-related books see Dimity‘s list here.